Criticism isn’t constructive when it is a lie. You’re ugly. Prove it. You’re too old. Prove it. You’re too skinny. Prove it. You’re arrogant. Prove it. You’re insensitive. Prove it. You’re writing-art-project-program-music-business-skill-post isn’t good enough. Prove it. Prove that this is about me, something related to me, or something I control, and I’ll listen. Sure enough, my blog template isn’t as responsive as I would like. Sparing you details, I can now see where it lacked ease of access, especially an easy way to view my latest posts. Criticism isn’t constructive when it comes from someone with no credibility or rightful authority. You want to tell me how to parent my children but you have no children and you have never worked with or studied children? Move on. You are concerned about my (fill in the blank) but you aren’t taking care of your (fill in the blank)? Move on. You aren’t my boss, my loving family member, my true friend? Move on. Feedback from an experienced and well-received blogger is priceless. It’s a free private consultation. A mentoring moment. A gem of wisdom. A gift. Criticism isn’t constructive when it’s mean. Direct -> “You look hideous in that dress! Well I’m just saying.” Indirect -> “You look sick. Are you OK?” Cue sad face of false concern. My two blog readers could not have been more kind. One discussed this matter with me on his blog. The other shot me an email. I appreciate the privacy. Both started and ended the conversation with sugar. I always appreciate true sweetness. Are you open to constructive criticism? Do you give constructive criticism? When was the last time you received or gave constructive criticism? Can you share an example of a false, no credibility, no authority, or mean, criticism you received? How did you handle it? I’ll follow-up this post with one about putting good feedback into action. In the mean time, look for something new here at Family Life Is More. This entry was posted in Challenges, Character, Lifestyle, Performance, Relationships, Social Media, Think and tagged Constructive Criticism, Creativity, Family. Bookmark the permalink. Ever since law school, I try to think of criticism as being useful or useless. That’s because one gets very blunt and direct feedback that would violate some of the rules you put in your post, but lawyers are expected to just forgive such transgressions (or at least, that’s what I was told). The short version of what I’m getting at is that criticism either will help you improve what you are doing, or it will do nothing for you. The former can depend on what criticism is being offered, but it also depends on how one receives said criticism. There have been times where I’ve found nuggets of wisdom in hurled insults. Even more frequently, I’ve found nothing of value in sugar-coated platitudes offered as criticism. I like the way you describe the dance of criticism well, the relationship of giving and receiving or rejecting, and our responsibility in each role. And you rightly point out that in certain environments and under certain conditions there needs to be a level of thick skin and freedom to talk with candor, urgency, or forthrightness, with the promise of forgiveness. Do I have examples of crappy criticism? I’m a writer and a computer programmer. Are you kiddin’ me? But…how much of the bad stuff do I remember? Well. That’s another question. Just me. Maybe. 🙂 Have a great Monday, Angie! Now that you mention it, maybe I was kidding?! I love your metaphor of real estate. And the word “vet”. The tough part, I find, is to be quick about it. I like that you added more questions for consideration, especially the “ring true” part. Oh, Angie. I hope I didn’t overstep, or come across as insulting. I was just stating what I thought you’d asked for, but if I misunderstood, I hope you’ll forgive my crassness. I’d never be harsh toward you, especially here, in your blog space. If i overstepped, please forgive me, and have a lovely day! Who was it that gave you that criticism? I think you just have to realize that you can’t please everyone and everyone is entitiled to their own thoughts. Whether they are entitled to beat you down is another matter. People can be very cruel with their criticism and that doesn’t do anyone any good. It isn’t up to other people to change what you have to say. I’d say hang in there. Maybe you touched a nerve and they’re hitting back. Exactly, Leslie! I’m only as beat down as I allow myself to be, which means I’m not beat down :D. Some of the random criticisms I used as examples were, gratefully, generic or cultural. While I’ve had my share of insults aimed at me, the older I get, the fewer they fly. Few people want to mess with me at this point in my illustrious career, lol. I actually have been told that I’m looking “too thin” but that is another post/s having to do with my improved health and fitness. You’re right, likely touches a nerve. Hang in there, my Dear. Just keep doing what you are doing! Thanks for the encouragement, Leslie! I’m hopping over to you blog shortly. Hope you enjoy that hop over! Excellent points, Michael. Your point about pushing ourselves toward excellent is important. While on the newbie part of the blogging learning curve, there are areas of mastery where I am tempted to get lazy. Thanks for sharing how you handled the feedback, especially after the sting. One of these days I’ll join in on Linda’s SOC! Put your toe in the SOC pond Angie, its a lot of fun and there are such diverse responses. Thanks for the encouragement, Michael. Linda runs one of the best blogging environments out there. Brene Brown’s “Daring Greatly” is on my nightstand as we type! I started it a few months ago and need to pick it back up. Thanks for the reminder Jill. “In the ring”, exactly. Yes we are! Is that the Rocky theme song I hear playing? what matters most is that we are happy. to entertain or welcome comments/reviews is our choice. Excellent point, Marlyn. And thank you for giving me the chance to clarify. I was also dissatisfied with this theme in some ways. For example, categories and tags are not easy to use or display well. Plus, personally I do want my blog to be more accessible. 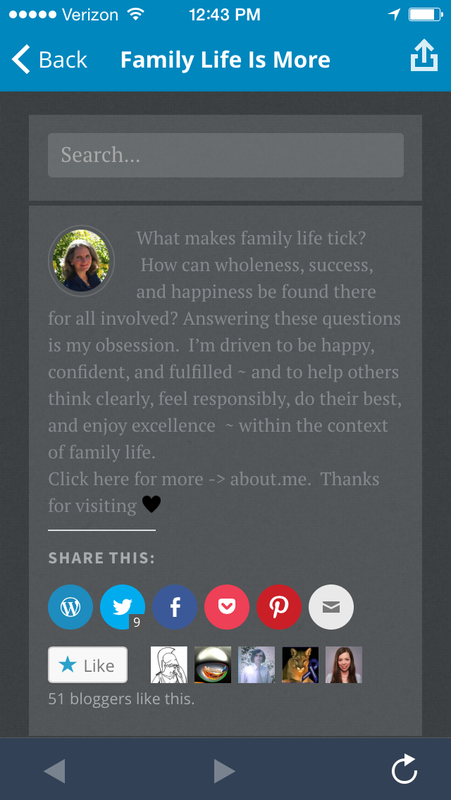 While I think my current blog is very pretty, accessing through different formats is cumbersome. So the changes I make will make me happier, too! Well, I confess that I don’t happen to care for this particular WordPress theme (Collections, is it?) — I feel like it obscures where the newest posts are — but after all, it isn’t my blog and just because I like other themes better doesn’t mean that other people ought. And I go through fits of changing my themes often enough because I’m not satisfied with them either. Yes, it up secures the newest post, as if there are too many doors to open to check for it. Is it behind door number one? Number two? Number six? But I enjoyed Collections while it lasted, it was a good run. I learned that I liked categorizing, tagging and organizing according to format. Oh the allure of the perfect theme. Oh dear yes, the perfect theme; why are they taking forever to make that one? I would have thought it would be among the first three or four they’d produce. Often the motivation behind the criticism also plays a role in how I accept it, Angie McFly. If it’s well-meaning but still not delivered so wonderfully, I’ll be more accepting if I consider it self-serving or even worse manipulative. Told constructively, yes, in hopes of making the product or life better, well yes, isn’t well-phrased advice a great gift? Thanks for this interesting post today, my friend. Nailed it, Mark. This is where street smarts, people smarts comes in handy. It is a skill in and of itself to be able to distinguish between well-meaning, self serving, or manipulative intent. I (want to) give benefit of the doubt until proven otherwise. Always, Angie McFly. I, too, tend to the trusting in my hope for people’s intentions. We all make the choice to enter a person’s blog world. I really don’t see the point in commenting about format, or even content. Just move on if you don’t like what you see. Seriously. Enjoy your own work, exactly, Van! That’s what I love about social media. There are so many ways to enjoy it. Creating content. Curating content. Reading. Engaging. Some or all of those combined according to time available, talent, interest, skills and goals. One of my favorite goals is to have my life enriched via social media. Thanks for being a part of that! What a great read and thoughtful article. I am new as a blog follower and have never had difficulty, it is very user friendly to the likes of me ;). Thank you for this honest, kind and thoughtful article…I am rolling it around and will need to read again….and again…applying it to my thought life. Your blog is a tremendous gift to me, thank you! Diane, you are a dear. Thank you for your endless insights and willingness to process difficult and important material with me. In addition to all of that, and more, you’ll visit and comment at my blog. Thank you always, (((friend))). A provocative post, Angle. My very first thought about constructive criticism in general, is whether it was asked for or not. That seems key. And if not, is the person in sound position to offer it. People say all SORTS of things to me in life (and I gather you’ve had your share of that too). In my mind, I sometimes think uncharitably, “who asked you.” More constructively, I ask myself, Who is this person to me? Do they have my best interests in mind? Do they even *know* what my best interests are? I see online – in many forms – so much unsolicited “advice” and criticism from people who feel safe behind a keyboard. My comparison is to how people drive on the highway, safely distant from other people and feeling emboldened by being surrounded by the buffer of a couple tons of fast-moving steel. It’s an easy trap to fall into, especially when it’s become convention. Colette, love it. You really capture the truth of both needing to be careful when offering advice (to ask ourselves if were being self-serving, example) and to consider the source. I don’t offer unsolicited advice now but when I was younger I fell into the trap of wanting to be “helpful”. Did they actually need my help or did I need to be helpful? Eventually I figured out that I needed to help myself first and I needed to respect that other adults were helping themselves as well. My exceptions are two. If keeping my mouth shut would contribute to big harm for someone or damage of some kind then I brave opening my mouth. These cases, fortunately, are not the norm. Colette, i’m so grateful that we have connected. Your thoughts make me think! I have had a lifetime of “helpfulness” that I’ve been working hard to correct (with definite progress). In relationships, I do speak up if I believe someone is wrong, as in unethical, dishonest, and so on. Whether in reference to me or someone else. You have a thoughtfulness and maturity about you that I appreciate, and I get the idea you’ve worked to get where you are. Oh, Colette, you made my day! Thank you! Excellent post!~…. I am often open to critics but I think that these points you have highlighted might be restrictions to that state of mindedness. I particularly agree as regard to mean critics and critics coming from someone with no credibility or rightful authority… I would say though that the worst critic ever is the mean critic that comes from a so-called “friend”. Sometimes the least expected person can just put us out!. Thank you for making this very important point, Aquileana! Is a friend really a friend if they are willing to put us out? If they are willing to criticize us freely? At some point the answer must be, no. Friendships need to be safe havens from the stormy world. Good friends, true friends, figure out a way to say the hard things to each other out of love. Your kindness, support, and generosity are so dear to me, *friend*. Friends help each other to confirm the truth. I like that! There really is a finesse about when to offer advice and when not too. “Who am I to…” is a great question to ask. For example, if the answer is, “I’m the parent” and it is my job to tell my teen that (fill in the blank) is unacceptable, then I need to do my job. If the answer is, “I’m a distant acquaintance” then, that can lead to a very different action, or inaction, based on the lack of relationship and responsibility. It’s your blog, your template, your style. You can’t please everybody…don’t even try (I did and it didn’t work). I think I listen to criticism very well, mostly if I like and respect the person who does gives me critique. However, often its just a judgment on taste or preferences…then I have selective hearing :-). Great post. Exactly! And thank you. Shortly after I wrote that post, I was side-swiped by a weird negative blogger experience. Sheesh. I should write about that sometime 😀 Selective hearing…you bet!